If you are a man heading into custody proceedings, you likely have a number of questions and concerns. 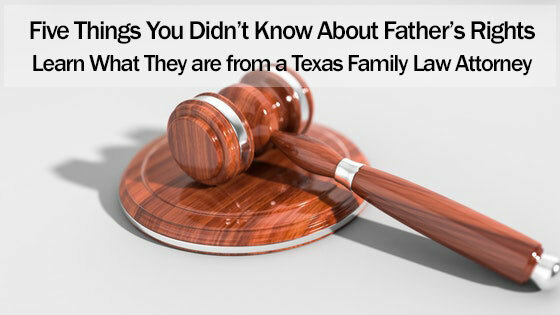 These likely include questions about a father’s parental rights in Texas. There are five things you may not know about your parental rights as a father. We will discuss these here, and you can also obtain more information from an experienced Texas family law attorney. Prior to the 1980s and 1990s, women were presumed to be the most suitable primary caretaker of a child. Fathers oftentimes were relegated to a secondary position when it came to involvement in the lives of their children after divorce. Texas law and judicial practice has changed. Child custody decisions are to be gender neutral. Fathers are to have an equal and meaningful presence in the lives of their children. If a father is not the primary residential custodian of a child, he is entitled to spend enough time with the child to develop a meaningful relationship. Indeed, there has been a movement from changing visitation to parenting time to underscore that a father is not a mere visitor in the life of his child. Perhaps the most important thing you don’t know about father’s rights is the legal standard that is used by the court in making decisions regarding child custody and visitation issues. The legal standard is the guideline used by a judge to make decisions regarding child custody and visitation issues. In the state of Texas, the legal standard is based on what is in the best interests of the child. A Texas family law attorney can provide you with detailed information about the best interests of the child standard used by Texas courts in custody proceedings. The state of Texas has adopted child support guidelines that are intended, in part, to eliminate a gender prejudice when it comes to determining the amount of money a father pays to support a child. A father is not solely responsible for financially supporting a child. The support obligation is sometimes equitably divided between the father and mother, depending on the circumstances. If you and the mother are not married at the time your child is born, you may need to have paternity legally established by the court. This might be necessary even if you are listed as the father on the birth certificate. If the mother agrees that you are the father, you can file a paternity case and sign an agreed order establishing paternity. If the mother disputes paternity, you will need to file a paternity case and ask the court to order DNA testing. Finally, even if the mother is granted primary physical or residential custody of your child, you have every right to seek legal custody. Legal custody is the ability of a parent to make major life decisions on behalf of a child. Major life decisions include such things as education, healthcare, and religion. Legal custody can be shared jointly between you and the mother of the child, even if the child lives primarily in the home of the mother. If you have questions about your legal rights in a custody matter, or if you need legal representation, the Law Office of David Kohm stand ready to assist you. Call our law offices today at any of our convenient locations and get a free consultation.